He was called “ALF” Landon. Born on September 9, 1887 in West Middlesex, Pa. Was once a governor of Kansas (1933-37) and unsuccessful Republican candidate for president of the United States in 1936. Landon went with his parents to Independence, Kan., in 1904. After receiving a law degree from the University of Kansas (1908), he entered the oil business. In 1912 he attended the Bull Moose Convention and campaigned in Kansas for the Progressive Party presidential candidate, Theodore Roosevelt. Thereafter his political affiliation remained with Kansas progressivism. In World War I he served in the U.S. Army chemical warfare service. After the war Landon returned to his oil business and Kansas politics. 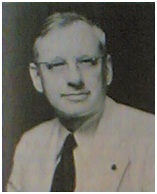 He was elected governor in 1932 despite a bitter interparty struggle; his re-election in 1934 aroused widespread interest because he was the only Republican gubernatorial incumbent to win that year. His victory led to the “Landon Boom” and to his presidential candidacy of 1936. Although nearly 17,000,000 Americans voted the Republican ticket throughout the country, the final tally showed that Landon had won the electoral votes of only Maine and Vermont. After the election he continued to take part in Kansas politics but did not again play in important role in national affairs.